Use your Thanksgiving turkey and cranberry leftovers to make this fabulous Panini that combines irresistible sweet and savory flavors in one great tasting sandwich. 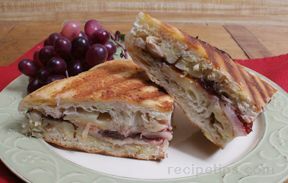 Turkey Panini is just one of many delicious leftover turkey recipes we have for you to enjoy. Cut loaf of bread in half. Cut in half horizontally through the middle. Butter outside of bottom half and place on the panini pan. Spread mustard on the top side of the bread in the pan. Layer cheese over the mustard, then the carmelized onion, then cranberries and then the pear. Top with six more slices of cheese. Top with the top half of the bread. Butter the outside all over. Turn heat onto medium, press the panini press on top and grill until the bottom is golden brown, approximately 8-10 minutes. Flip the sandwich over, press and grill the second side.